Shop online for 17 airbrushes clearance items at discounts up to 65%. Paint Brushes is the most popular of the 4 airbrushes clearance items categories, then Compressors, and Accessories. Testors is ranked #1 out of 6 airbrushes clearance items manufacturers, followed by Paasche Airbrush Comp., and Atlas Brush Co.. This is a Testors #0 Golden Synthetic Round Model Master Paint Brush. FEATURES: Solid birch wood handle Seamless nickel-plated ferrule Hand-formed synthetic gold bristles are glued into the ferrule. Durable bristles and finely stacked point are well suited for applying liquid cement. For detail painting, color application and ultra-fine control of washes. Packaged in a bubble pack with peg board header card. This is the Testors General Purpose Acrylic Paint Nozzle For use with Testors Aztek Airbrush Systems. This is a Testors 3/8" Camel Hair Flat Model Master Paint Brush. FEATURES: Solid birch wood handle Seamless nickel-plated ferrule Hand-formed camel hair bristles are glued into the ferrule. Soft, fine bristles are designed for high-gloss finishes. For color application of large areas, broad smooth coverage of gloss paints and broad application of washes. Packaged in a bubble pack with peg board header card. Powerful, compact, and portable. 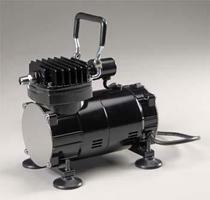 It is suitable for most airbrush work and will provide years of dependable service. This is the Tamiya Spray-Work Super Fine HG Airbrush III. This is the Trigger for Model 100, 150, 155 & 200 from The Badger Airbrush Company. This is the Needle Chuck for Model 200 from The Badger Airbrush Company. This is the Aluminum Handle for Model 200 from The Badger Airbrush Company. 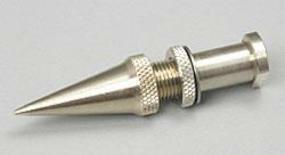 This is the Nickel Silver Tip (FT-1) from The Paasche Airbrush Company.